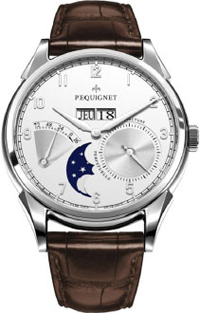 The new Royal Grand Sport by Pequignet at the International Exhibition BaselWorld 2012. Swiss watch manufactory Pequignet in March of this year, will present at the International Exhibition BaselWorld 2012 watch his latest creation Royal Grand Sport Collection, whose elegant and discreet design immediately attracts the attention of the public. 44-mm shell opens new eyes wide face, which in perfect harmony are more complex, built in the manufacturing mechanism Calibre Royal. Indicators as wide, making it even easier reading, and placed in absolute symmetry. Pile of complications becomes a perfect simplicity, and the variety of technology is giving way to majestic elegance. First grade Pequignet uses his manufactory caliber with the new Calibre Royal integrated into a complication: a clockwork drum with the distribution of force through the central axis. Caliber provides 88-hour power reserve and the balance in the frequency of 21,600 vibrations per hour. Indications of a large double-aperture date and day on three discs can vary the instantaneous triple-step. These aperture on the dial is adjusted by the crown, with the indication of the current time does not stop. The balance compensating gauge attached with screws. Bi-directional automatic winding mechanism of a highly efficient system – is a magnificent masterpiece of innovative technology coupled with perfect harmony. The elegant case model is made of 316L stainless steel and polished. Stainless steel case back screwed for durability 6 screws with polished heads. Sapphire crystal with anti-reflective coating protects the body from the front as well as from the rear. Water resistant 5 ATM hours. Crown in position 3 o’clock decorated with floral Fleur-de-Lys. In the silvered opaline dial is double the square aperture. Burnished index phases of the moon in a position covered by 6:00 rhodium-plated. Indicators of a small second hand between 3 and 5 hour power reserve, and at position 8 o’clock decorated with delicate guilloche. The dial is graduated in Arabic numerals and minute markings in the form of railway track. The clock is also made of stainless steel. The model included brown alligator strap with a buckle, decorated with beads in the style of Fleur-de-Lys. Buy Watches Royal Grand Sport Collection will be from official representatives of the company Pequignet.